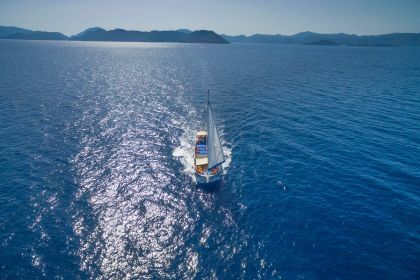 A yacht charter holiday in Fethiye, on Turkey's Riviera, is just the ticket for an enriching pampered adventure at sea. 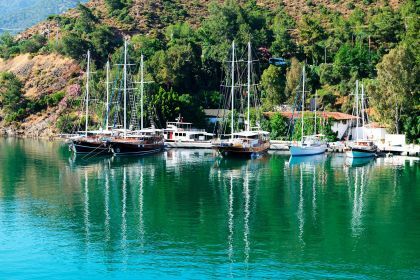 For the most pristine natural beauty on the Turquoise Coast, opt for Fethiye. This pine-clad coastal city boasts the most beautiful aquamarine water, photogenic lagoons, a primeval gorge and ancient ruins. The low-key, relaxed Fethiye is an excellent base for visiting Oludeniz (Ölüdeniz) and other interesting sites including the eerie ghost town of Kayaköy. And the nearby island of Sovalye (Şövalye Adası) made a cameo in the James Bond film, Skyfall. 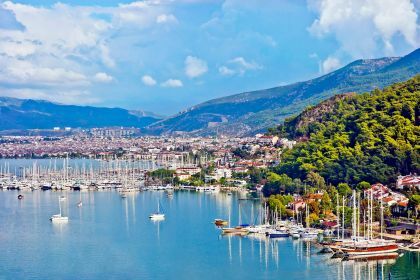 It’s also within easy sailing distance to lively Göcek, the heart of Turkey’s yachting industry. 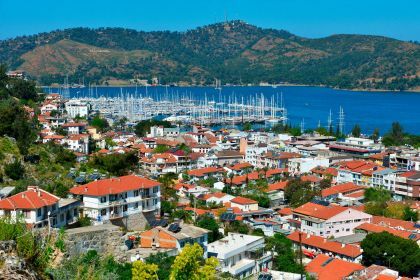 Fethiye is an essential destination for a yacht charter in Turkey. Adventure-seekers will find plenty to do in Fethiye. Because Fethiye stands on the site of the important Lycian city of Telmessos, there are plenty of monuments scattered throughout the city. Perhaps the most famous is the Tomb of Amyntas in the south of the city - a foreboding old tomb cut into rock. You can climb the stairs that lead right up to the tomb and have a poke around. Go up at sunset for a truly atmospheric vista of the shimmering Aegean. You can also visit the ancient city ruins in Xanthos, which was the capital of ancient Lycia. 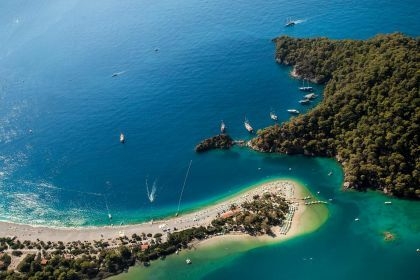 You’ll find an abundance of top-notch beaches in and near Fethiye if you want to step off your private yacht for a while. Patara Beach is Turkey’s longest strip of beach, and possibly one of the best beaches on the Mediterranean. The fine white sand and shallow water- you can wade out for a while until the water gets deep - make it ideal for kids, although the waves can get rough at times. Another wonderful place to add to your itinerary is the remote Butterfly Valley, home to the Jersey Tiger Butterfly, with a secluded beach nestled between two steep cliffs. It’s not reachable by road, so you can swim and sunbathe in peace. Fethiye can get a bit crowded during peak summer, so consider including the small, unspoilt island of Sovalye in your itinerary. There may not be a lot of amenities on the island but exploring this hidden piece of paradise, knowing you have all the comforts of your private luxury yacht at hand, is well worth it. Think virtually deserted beaches, picture-perfect snorkelling spots, and shady walkways through pine-scented forests. Insider tip: The Lycians buried their dead among the living. You’ll find stone coffins i.e. sarcophagi scattered throughout the town of Fethiye - a very well-preserved one is on the main street. Indulge in the freshest of seafood in Fethiye, with its vast fish market and several good restaurant choices. Ece marina is a five-star marina lined with restaurants serving up a variety of fare. Ece is a lively area with plenty of restaurants and shopping. For an unrivalled view over the harbour, dine al fresco at Alesta Yacht Hotel, a 4-star hotel with its Alarga restaurant, serving up both authentic local dishes and western options. Gourmands might like to try Unique Restaurant, known for its top-notch gastronomy. Located in a boutique hotel, also called Unique, the restaurant caters for sophisticated palates with its selection of international, local and Ottoman cuisines. Take a seat outside and enjoy the romantic view of the bay. After dinner, go down one level to the bar for a nightcap. Step off your private yacht and indulge in the buzzing nightlife of Fethiye. You’ll find many cocktail bars in Hisaronu (Hisarönü), a village in Fethiye with a reputation for being a party hotspot. Teeming with bars and clubs, there’s no shortage of nightlife here. For a calmer atmosphere with seafront views, try one of the seaside bars in Olu Deniz. For a fabulous night out, visit the upmarket resort, Hillside Beach Club, situated on its own private bay. Dine on Mediterranean fare at the vibrant Pasha restaurant and then dance the night away at the afterparty, where popular DJs perform nightly. The hotel also hosts family friendly beach parties complete with carnival-style entertainment. Or plump for Fethiye’s charming old town where you’ll find Flow Art Lounge Bar, with an eclectic atmosphere, sumptuous cocktails and live music on certain days of the week. Children will find no shortage of things to do on a yacht charter vacation along the Turkish Riviera. With stunning water and a plethora of bays and inlets, the options for water sports are endless. There are plenty of plush resorts offering water sports and kids’ activities, or you can ask for your private yacht to be stocked with canoes, water-ski and snorkelling equipment. If you’re visiting a resort for the day, many offer kids’ lounges and play areas. For something a bit different and action-packed, take the kids to the Fethiye Adventure Park. For kids that are a bit older, there’s the option of exploring Turkey in an off-road, open-top jeep safari. You’ll see ancient ruins and can even visit Saklikent Canyon, where you and your children can walk through the gorge and splash around in the water. The weather in Turkey remains warm and sunny a lot longer than many other Mediterranean destinations, so if you go a bit earlier or later in the season you’ll dodge the summer crowds while still enjoying long sun-soaked days on the deck of your luxury yacht. 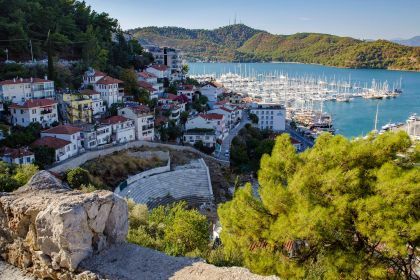 If you’re considering a fabulous yacht charter on the Turquoise Coast, we’ll help you plan the perfect itinerary that includes remote bays, exquisite gourmet dining, pampered luxury and fascinating history. Drop us a line here or give us a call for a picture-perfect yacht charter experience in Fethiye.